Firstly, congratulations to Boston for the Stanley Cup win. It was an amazing run. Tim Thomas played a tremendous series, and Boston was clearly the better team. I’ll always be a Canucks fan but that being said, I am absolutely sick to my stomach disgusted with Vancouver’s reaction to the loss this evening. The day started great. Cheering crowds, smiling kids, free samples, but as soon as the game ended the crowds had divulged into an angry mob hell bent on our city’s destruction. I’ve played witness to immigration protests in Australia and Maoist uprisings in Nepal, but I have never in my whole life experienced a mob of such hate filled individual’s hell bent on indiscriminate civic destruction. Call me naive, but I didn’t even think Vancouver was capable of this. What happened to the jubilation we saw during The Olympics? What happened to sportsmanship? What happened to morality at its most basic level? The day started out packed with cheering fans (5:35pm). Ok maybe a little too packed. Reports from inside the stadium state that The Bruins victory was met with applause, the sort of class I would have expected from our hockey fans. Outside on the streets we threw our class down the drain before the game was even finished. We live in Canada, one of the greatest most peaceful places on Earth, and this is how we react to a hockey game? I realize that a lot of people instigating these riots were mostly “anarchists” who were there from out of town with the intent to cause trouble, most likely in a sick premeditated attempt to relive the riots of 1994. Though I am sure they exist, I don’t know a single person who lives in Vancouver who would willingly take part in it’s destruction the way I saw it tonight, but I know that locals have certainly taken part as well. It was a mixed bag of terrible people doing terrible things. Even before the game was over, masked instigators started causing problems. Some of them even had gasoline and Molotov cocktails, apparently with the intent to start a riot win or lose. After watching 3 cars torched and destroyed the police backed out and mobs started burning and destroying whatever they could find. I managed to put out two fires with two good Samaritan bicyclists, but while trying to put out a third trashcan fire, things took a turn for the worse. I spent the night in emergency because on my way out of the city. I was knocked to the pavement after stepping in to put out a garbage fire. One of the rioters who sucker punched me also destroyed my Canon 5D Mark II and one of my lenses. If you come across any photo or video evidence of this incident I would greatly appreciate it if you could email the Vancouver Police Department to help aid their investigation. Though my jaw is still swollen it only took three stitches to patch my eye up. It’ll take much more than that to wipe this memory from my my mind. I hope we can move forward as a community and build ourselves back up to be the world class city that I know we really are. Please email all evidence to riot@vpd.ca with a dates, times, locations, and descriptions. Here are a few snaps from Candy and Stephen’s wedding this Saturday. The whole wedding day was heaps of fun, and Candy was the perfect bride to photograph because she was having a blast throughout the entire day (pristine church -> smelly fishing wharf). The 2010 Winter Olympics brought a certain madness to the city of Vancouver. All aspects of normal life surrendered to a crazed sports fever whose symptoms culminated in a huge Canada wide party in the aftermath of Sydney Crosby’s gold medal wining goal for Canada. 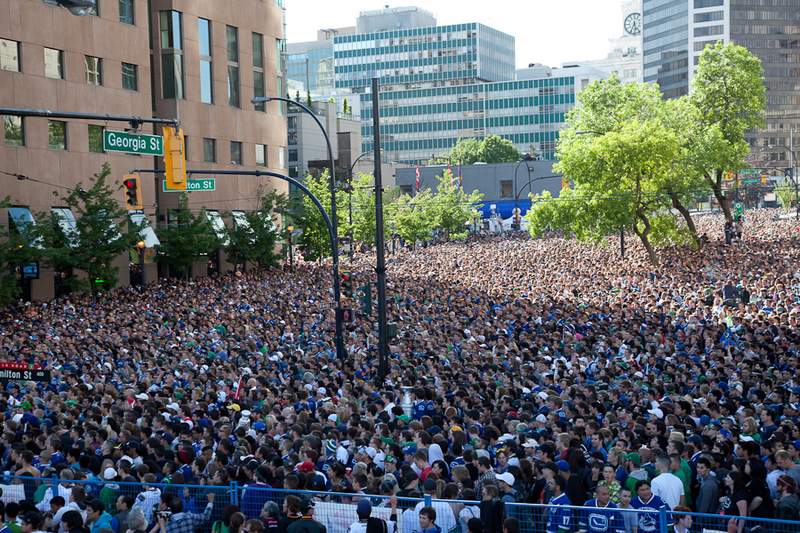 It would appear that the Vancouver Canucks 2011 Stanley Cup playoff bid may have not only have brought that hockey madness back, but intensified it dramatically.